There are a number of important differences between the government’s ‘national living wage’ and the independently calculated, voluntary Real Living Wage rate of pay. The ‘national living wage’ is a rebrand of the National Minimum Wage, and is ££8.21 per hour (as of April 2019) across the whole country. It is a statutory minimum and all employers have to pay it to employees over 25 years of age. There is one rate for the whole country with no allowance for the higher costs of living in the capital. The Real Living Wage, on the other hand, is independently calculated, voluntary and based on the cost of living. The Real Living Wage has different rates for London and the rest of the country, recognising the higher costs of living in London. The London Living Wage rate is £10.55 per hour and the rate for the rest of the UK is £9.00 per hour. We have provided substantial funding for the campaign to increase the number of employers paying the Real Living Wage. It is a statutory minimum and all employers will have to pay it to employees over 25 years of age. There is one rate for the whole country with no allowance for the higher costs of living in the capital. It does not apply to employees under 25 years of age. It is set by the Low Pay Commission and the new annual figure comes into effect on April 1st each year. It is currently set at ££8.21 per hour (from 01/04/2019). Employers are required to pay the Living Wage to apprentices over the age of 25 who have been in an apprenticeship scheme for 12 months or more. It is voluntary; employers choose whether or not they pay it. It is independently set, based on the cost of living. There are two rates to recognise the higher costs of living in London. The London Living Wage rate is £10.55 per hour and the rate for the rest of the UK is £9.00 per hour (from 5/11/2018). The Living Wage rate applies to all employees 18 years and over. The annual rate is announced as part of Living Wage Week (beginning of November) and employers have 6 months to increase salaries from the date of the announcement. Under the accreditation scheme, employers are not required to pay the Living Wage to apprentices or interns, although this is something we would encourage as good employment practice. You can find out how to become an accredited Living Wage employer, through the Living Wage Foundation website. Although work is the most important route out of poverty, more and more poor households in the capital include someone who is working. 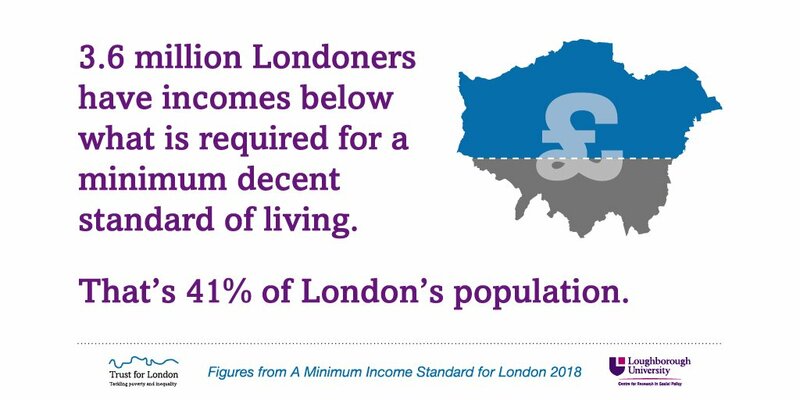 21% of employed London residents were low-paid in 2017 - meaning that they earn less than the London Living Wage. This represents a 50% increase from the rate in 2007. We believe that paying a Living Wage is a positive step to help lift more Londoners out of poverty and improve their quality of life. We were concerned about the growth of low pay and in-work poverty. The Living Wage campaign had been around for a number of years, but it lacked resources. We felt that with significant additional investment, a step-change in the campaign could be achieved. We wanted to see more employers signing up; wider recognition of the real Living Wage among politicians and the general public; a formal accreditation system for employers being designed; and a better evidence base about the costs and benefits of a real Living Wage. Citizens UK was awarded £850,000, over four years, for campaign work in the higher education, retail and public sectors and to establish a body to accredit employers and promote the Living Wage (the Living Wage Foundation). Further funding of £240,000 was awarded in December 2013 towards developing the Living Wage in London’s retail and hospitality sectors. Research at Queen Mary, University of London was commissioned to undertake independent research on the longer-term impact and potential benefits to employers and employees of a Living Wage. We also part-funded research undertaken by IPPR and Resolution Foundation to examine the costs to employers of paying a Living Wage. Evaluation – Cambridge Policy Consultants were commissioned to undertake a four-year evaluation to assess the impact of the Living Wage special initiative. The special initiative was supported by an Advisory Group of representatives from a range of interested parties, including the TUC, London Councils, Greater London Authority, Business in the Community, KPMG and Joseph Rowntree Foundation. Members also included individuals from Trust for London and Citizens UK. Our funding of the Living Wage forms part of our wider work around low pay. The special initiative has now come to an end, but we are still very much committed to the campaign. We still sit on the Living Wage Week Steering Group which helps to co-ordinate plans for Living Wage Week each year. In addition, we provide a grant to the Living Wage Foundation towards the annual calculation of the Real Living Wage, in line with the annual cost of living. Until recently, we sat on the Steering Committee of the Living Wage Friendly Funders scheme, which supports charities to pay the real Living Wage through their grant-making, and to tackle low pay in the charitable sector. There are currently 35 such funders including Comic Relief, People’s Health Trust, Barrow Cadbury Foundation and Islington Council. We continue to work with the scheme and still promote its principles through our own grants policies and practice. Staff leaving rates fell by 25%. 54% of workers felt more positive about their workplace. 52% of workers felt more positive about their employer. 38% of workers felt they had greater spending power. 32% of workers felt it improved their family life. There was an improvement in psychological well being. Cost-benefit analysis by IPPR and Resolution Foundation showed the government could make annual savings of £2.2 billion if everyone was paid a living wage and 4 million people would benefit. This research also showed that the cost of paying a Real Living Wage would add less than 1% to the wage bills of firms in sectors such as construction, food production and banking. Data from London’s Poverty Profile shows that some groups are particularly low paid: 46% of employees of Bangladeshi and Pakistani origin in London are low paid, more than twice the rate for White British employees. 37% of disabled people are low paid compared with 27% of non-disabled people. The proportion of employees who are low paid is extremely high in the hospitality sector (hotels and restaurants) at 64%. The industry with the second highest proportion of low paid workers is retail and wholesale at 41%. Wider lessons from the initiative include a strong endorsement of funding campaigning work and recognition that this can have clear and tangible benefits for disadvantaged communities. The latest available data on low pay in London can be found at the Trust’s London’s Poverty Profile. The Living Wage Foundation was established with our funding and it has been accrediting employers since 2012. In the retail sector, LUSH became the first champion in May 2011. In October 2013 we awarded Citizens UK further funding (£240,000 over 3 years) to strengthen the campaign specifically in the retail and hospitality sectors. Combined, these sectors are the greatest contributor to the problem of working poverty and in London. Since then, major retailers such as IKEA, Lidl and Aldi have committed to paying the Living Wage and have become accredited employers. In September 2013, Professor Jane Wills at Queen Mary, University of London calculated that the living wage campaign had benefitted 23,000 low-paid workers and this generated income for these workers of £46 million. In 2018, over 4,000 employers are signed up, including a third of FTSE 100 companies and household names including Ikea, Aviva, Nationwide and Everton FC.